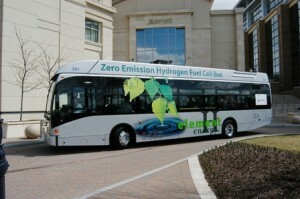 The transit bus market is ideal for initiating the first steps towards a hydrogen economy. Hydrogen fuel cell powered buses can provide urban and commercial areas with advantages over typical transportation methods due to their quiet, greenhouse gas emission free capabilities. There are approximately 921 transit buses that provide public transportation services in Connecticut. While there are significant efficiency and environmental benefits associated with FCEBs, expended use of FCEBs may require: 1) fueling infrastructure to be co-located with the FCEB storage facilities, 2) redundancy of fuel supply, 3) generally accepted fuel measurements & certifications, and 4) an established track record for up-time performance.